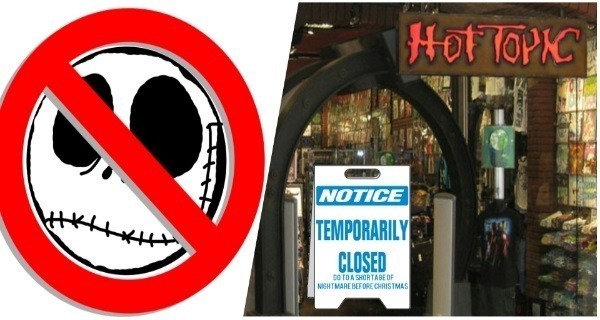 A local Hot Topic almost went out of business this weekend after running out of Nightmare Before Christmas merchandise. The store, located at the Natick Mall in Worcester, MA, failed to get its usual shipment of merchandise on Friday, and quickly sold out of what little Nightmare inspired stock they had left. “When we sold our last Oogie Boogie hoodie on Saturday afternoon…that’s when I knew we were in trouble!” confessed 24-year-old assistant manager, Doug Bindlestiff. Though the Hot Topic chain has long held a reputation as a place that teens longing for mass produced individuality can go to buy their goth and punk fashion, sales of piercings and studded belts actually make up less than 4% of all purchases. “The majority of our profits come almost exclusively from products based on the 1993 stop-motion film Tim Burton’s The Nightmare Before Christmas,” explained Hot Topic CEO, Lisa Harper. Indeed, though Bindlestiff tried his hardest to keep customers coming in – including at one point, offering a free Falcor Pop with every purchase – it didn’t take long for word to spread that the Natick Hot Topic was Nightmare-less, and by Sunday the store was a ghost town. “We tried pushing everything else Millenials seem to like: Invader Zim, Labyrinth, even My Little Pony: Friendship Is Magic but no one was biting!” said Bindlestiff. If Hot Topic’s sales are any indication, a lot.